A singing teaching resource by Jeff Mead and Kevin O’Mara. Suitable for use with students in middle and upper primary. 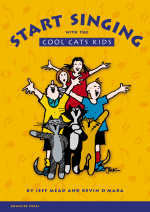 Start Singing with the Cool Cats Kids is designed to be a useful resource for any choral application, from classroom singing to choirs. It contains sections on voice exploration, warm-ups, exercises in breathing, tone, pitch, diction and harmony. Additional sections include troubleshooting, performance ideas, frequently asked questions – and even microphone technique. There is even an easy ‘recipe’ for singing sessions! The sections are arranged in an order for ease of location and use but are not intended to be necessarily used in a sequential way. Use whatever activities, exercises or songs suit your needs, in any order you like. Many of the songs make excellent performance pieces. The CD has vocal demonstrations (particularly useful for harmony) and backing tracks (great for performance).